In a previous article we spoke of the various reasons -- artistic, theological and liturgical -- for employing antependia. One of the points raised was of the importance of colour, not only for giving prominence to the altar, not only because of the beauty it brings, but also because of the fact that it heightens liturgical symbolism both within and without the context of the sacred liturgy. In that piece it was noted how O'Connell commented that the frontals' "sequence of colours and its changing form and decoration lends variety and new beauty to the altar, and helps to mark the degrees of festivity in the Church’s liturgy." Geoffrey Webb and others have made similar comments about this symbolism. 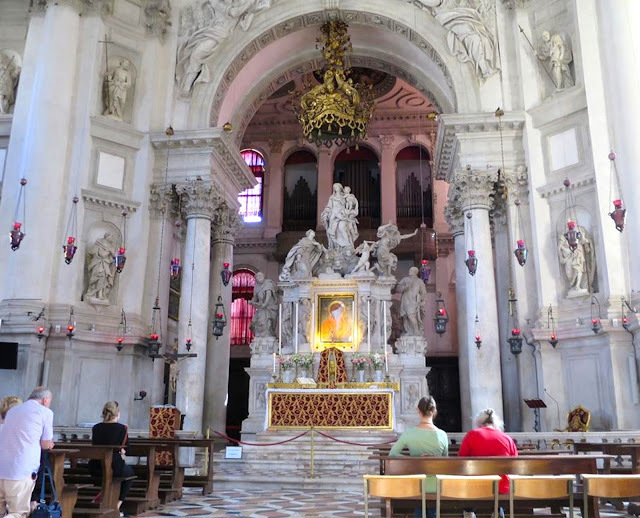 We provided some photos of the London Oratory in that post but it seemed appropriate to provide some further examples, this time within the context of the basilica of Santa Maria della Salute in Venice. 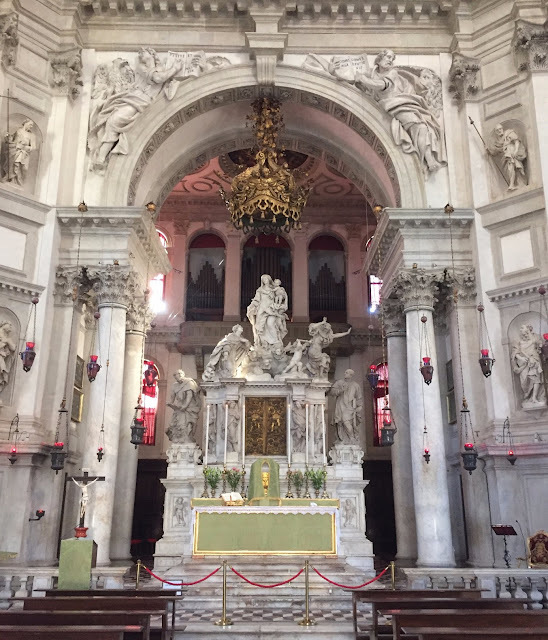 Let's begin with some tighter views of the principal altar of the basilica in order to explore O'Connell's point of how frontals help define a "new beauty" for the altar and mark various "degrees of festivity." 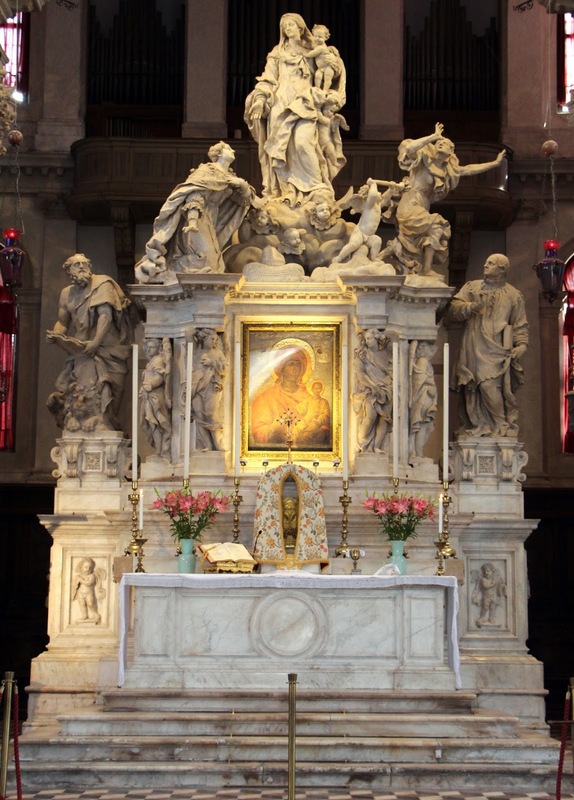 We shall begin with the altar unvested (i.e. 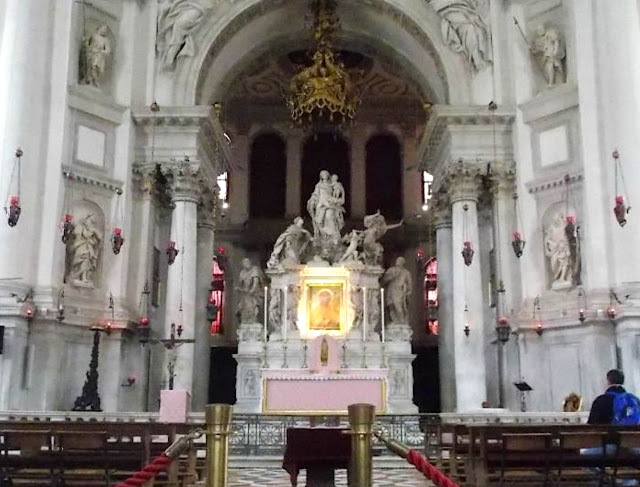 without antependium) and proceed through similar views of the same altar with antependia of various colours. 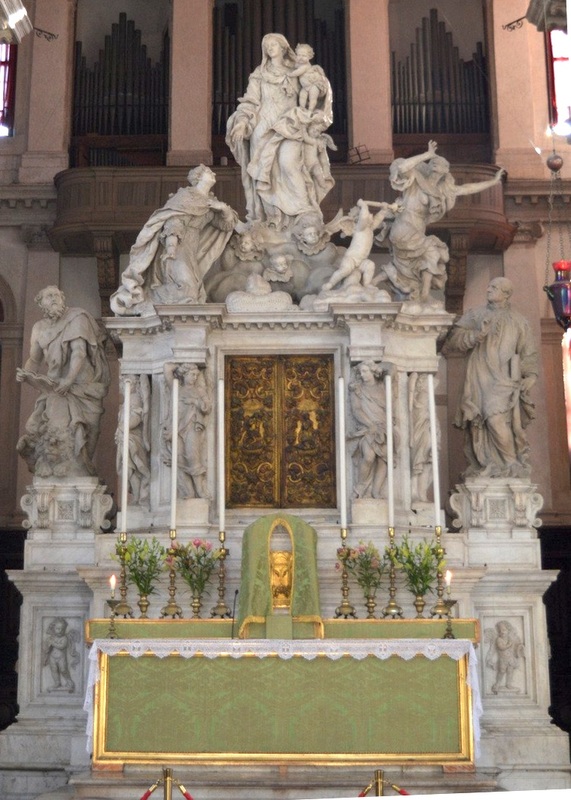 Seen above is a fairly typical arrangement nowadays; namely, the tabernacle has some sort of veiling in the liturgical colour of the day or season, but the altar itself is unvested. It is a noble enough altar for certain but let us now proceed to the vested forms of this same altar. The tabernacle veil remains the same but the altar is now vested in liturgical white. 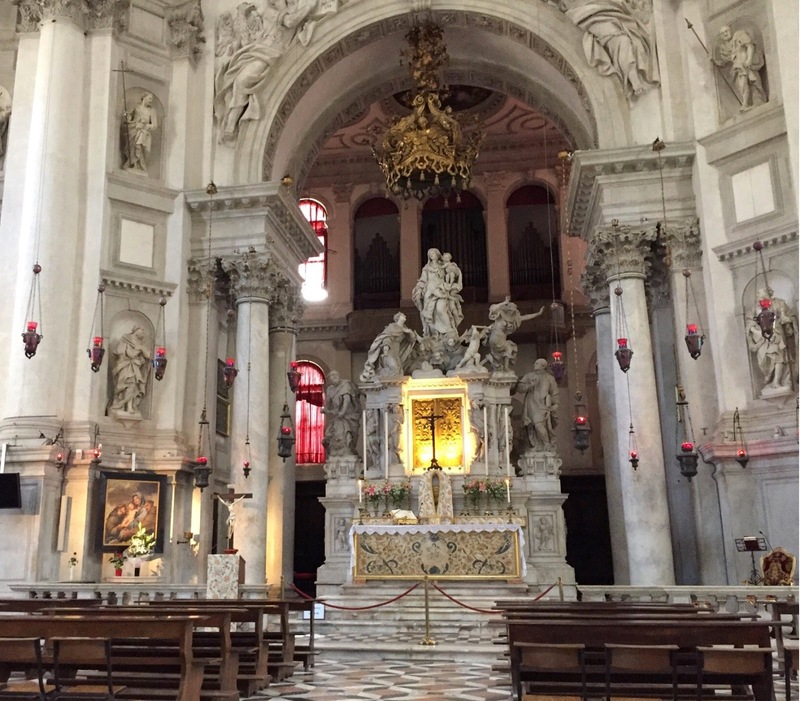 This particular basilica also has a golden metallic frontal that is used for particularly solemn feasts, touching this point of degrees of festivity. Green seasons can have their own particular beauty. Violet. You will also note how flowers have been removed from the gradines, marking the more penitential nature of the liturgical season. This is yet another example of how all symbolic details, no matter how small, ought to be considered. Rose for Gaudete and Laetare Sunday. Complimentary coloured flowers have now reappeared as the penitential character is slightly lessened. 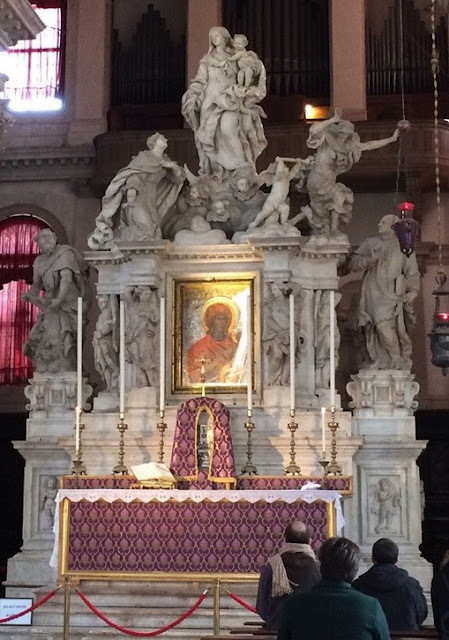 Within each example shown here, you will note how the antependium influences the overall character and feel of the altar, just as the vestments of the sacred ministers do. What's more, I'd note again how the floral ornamentation is also matched to the liturgical colour of the day. This ties back to this concept of the harmony of the liturgical signs and their importance. Make no mistake, all such details make an impression, consciously or unconsciously. The other aspect raised by our referenced authors is of how antependia can help to draw attention to the altar as a central point of focus. 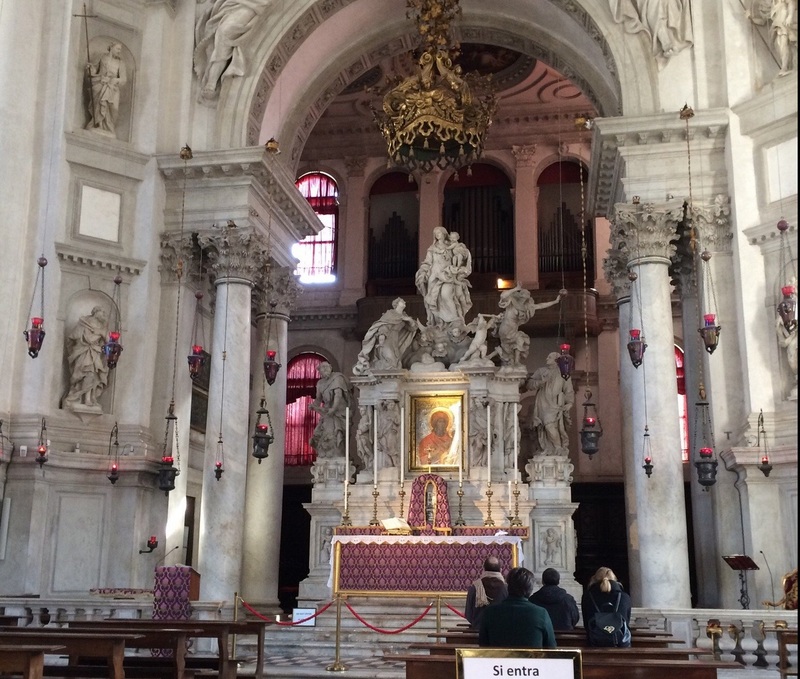 This is so in the most grandiose of basilicas -- and all the moreso in more typical parish settings. To help demonstrate this point, I wanted to draw back from the altar slightly and give a wider view. As we do so, do take note of how the eye is drawn toward the altar itself. 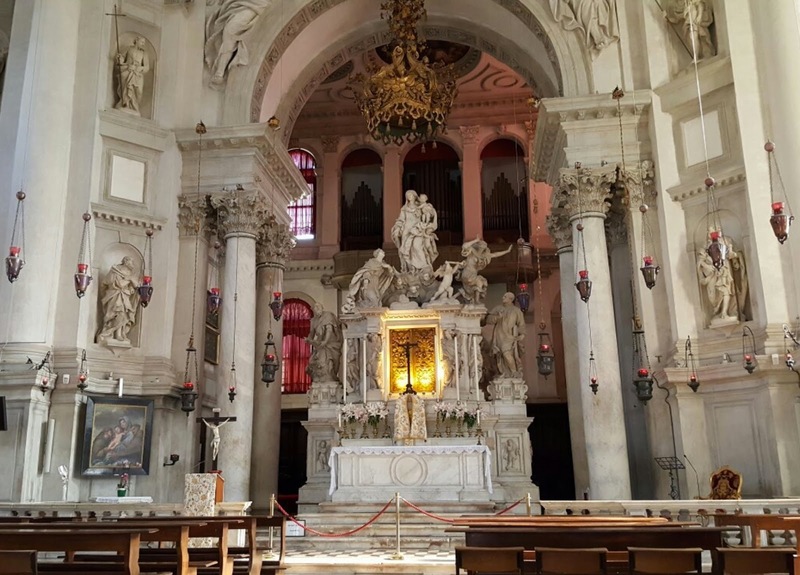 Also take into consideration how these variances of liturgical colour not only provide a pleasing variety, but also draw one into the liturgical life and symbolism of the Roman church. We begin again with the altar unvested. 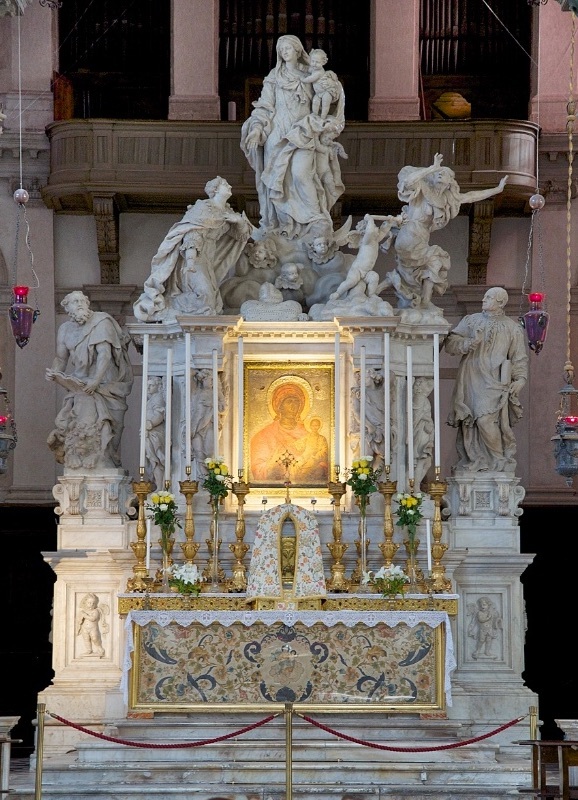 In each instance, the eye is drawn to the altar by virtue of the splendour of the colour introduced by the antependia. What's more, it is as though the altar is made anew by each variance of liturgical colour that is introduced -- and that again, in turn, helps to draw one's attention to the altar and increase our engagement. In addition, I would also note that the use of this liturgical ornament helps to ensure that our architecture is not itself liturgically agnostic, but rather liturgically engaged. We have spoken of the need for marking times of liturgical festivity so that they should stand out from the everyday and this is just a further extension of this principle. The lesson that would seem important to take from all of this is that antependia are not trite or epicurean details. 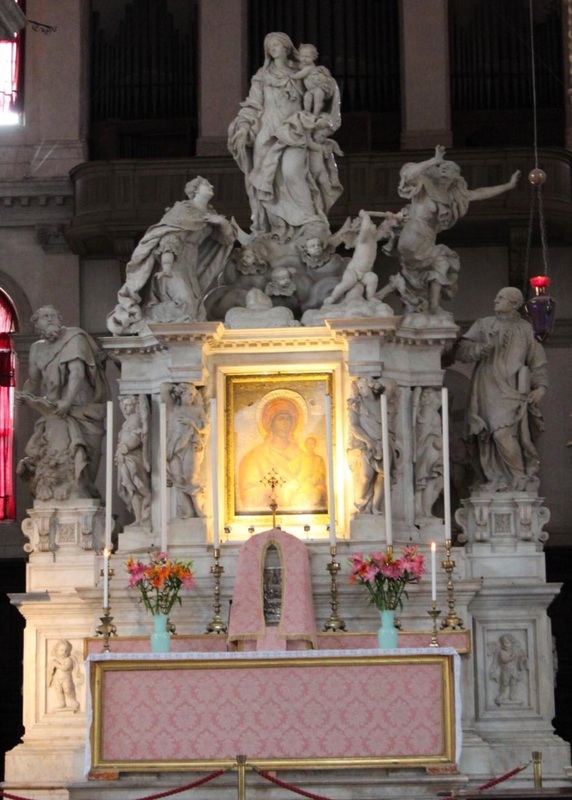 They are actually extraordinarily potent liturgical symbols that have the power to move the soul and engage the mind. The question then (rhetorically) becomes: why wouldn't you wish to take full advantage of all the liturgical tools you have at hand?